VULTUREMAN invents a Super Power Potion, which gives him great magical powers, enabling him to mesmerize and defeat TYGRA. 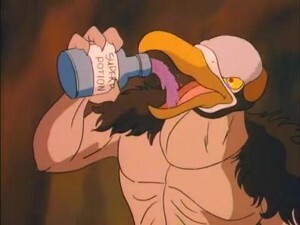 VULTUREMAN then makes a deal with MUMM-RA: He will share the potion in exchange for MUMM-RA’s secret to everlasting life. VULTUREMAN asserts his authority over the other MUTANTS, putting S-S-SLITHE in a trance. 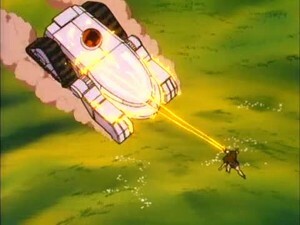 He attacks and defeats PANTHRO as the latter searches for TYGRA. S-S-SLITHE recovers and commands the MUTANTS to search for the potion. 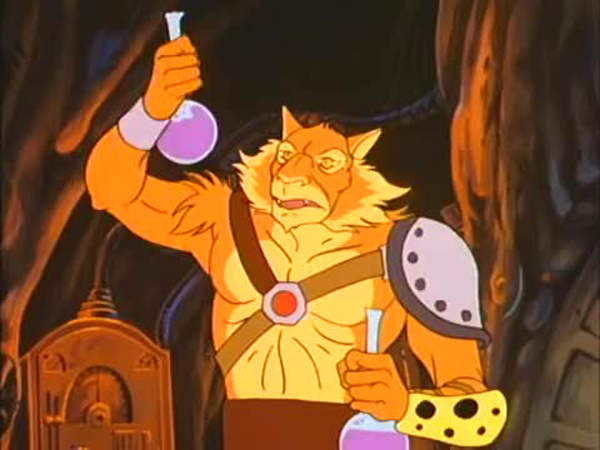 As they discover it, MUMM-RA materializes and confiscates the vial. Meanwhile, VULTUREMAN challenges LION-0 and is about to defeat him when his super powers wear off. MUMM-RA appears and denies VULTUREMAN’s plea for another dose of super power. LION-0 destroys the potion and VULTUREMAN slinks away defeated. 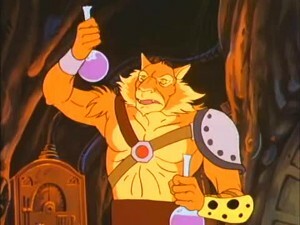 Vultureman becomes a formidable foe against the ThunderCats when he invents a Super Power Potion. 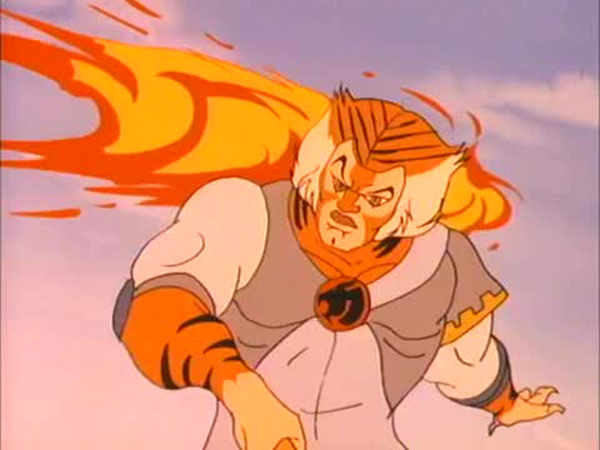 Empowered with its effects, he makes a pact with Mumm-Ra to destroy the Mutants and the ThunderCats in exchange for Mumm-Ra’s secret of everlasting life. However, his pride and his ambition are his undoing, when the effects of the potion and his power prove to be temporary. 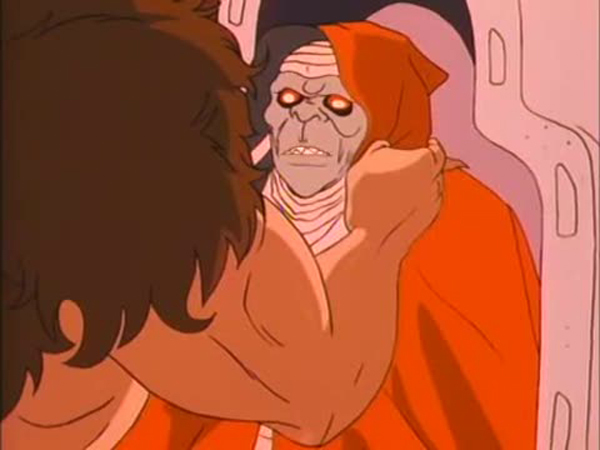 Mumm-Ra turns out to be an unreliable and selfish ally, who withholds the remaining potion from him. Reduced back to the limits of his normal powers, Vultureman is defeated by Lion-O and the ThunderCats. Vultureman is guilty of a pride and an over inflation of his abilities and importance when he extends himself beyond normality. 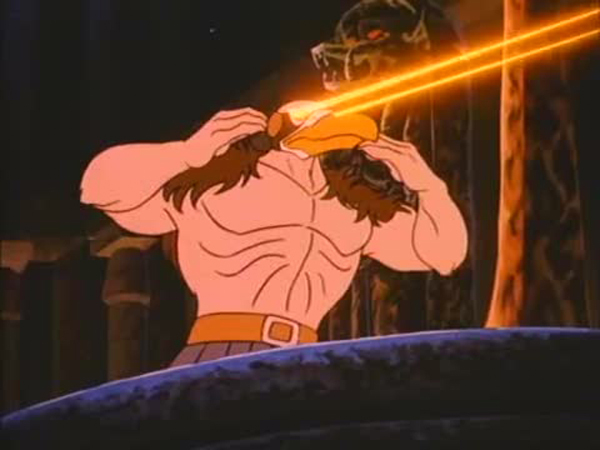 Deluded into thinking he is permanently more powerful than others he acts with egotistical and antagonistic independence, by turning against his friends, the Mutants, and by negotiating an alliance with Mumm-Ra. Since the alliance is not based on honor or friendship, Vultureman is left to his own devices when the effects of the potion wear off, and he is taught a difficult lesson. The impulse to overinflate our opinion of ourselves and to set ourselves apart from others is a common one we face when we have succeeded in something. For example, when we win a competition or excel in an examination, we become so self-assured that we may unrealistically compare ourselves to others and think we are better than they in all things, and we falsely judge that we will never need their help and collaboration. But time has a way of balancing such opinions and teaching us to be more realistic about appraising our own and others’ abilities. The truth is that we do not excel in everything at all times and in life we will endure both successes and failures, winning and losing, being competent in some areas and less so in others. Part of maturity is learning from this lesson. It is good to have a proper sense of our true worth. But the attempt to see ourselves as unconditionally better than others is unwarranted. We are part of a community of persons and each of us has unique talents and abilities. From the moment of his debut in “Lord of the Snows”, Vultureman set himself up as one of the most intriguing Mutant characters. 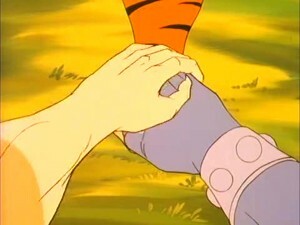 Unlike the other three main Mutants, to whom we are introduced in the series’ pilot, Vultureman’s arrival on Third Earth is shrouded in mystery – whilst it could be argued that this is actually weak storytelling on the part of the writers by not explaining how this arresting character came to be such a prominent figure in the ThunderCats’ adventures, in actual fact his mysterious arrival takes nothing away from the character. Over the course of the series Vultureman would emerge as a fan favourite, thanks in no small part to his constant desire to betray the other Mutants and seize power for himself, and this episode marks the first time he endeavours to strike out on his own. 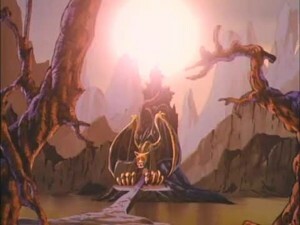 Some of what makes this relatively simple episode so entertaining is because the seeds of Vultureman’s desire to establish himself as an independent power on Third Earth have been sown in earlier episodes for, since his emergence as a main character in the series, Vultureman has, prior to this episode, been seen expressing dissatisfaction with what he perceives as the inferior intellects of his fellow Mutants, and this all seems to come to a head here. 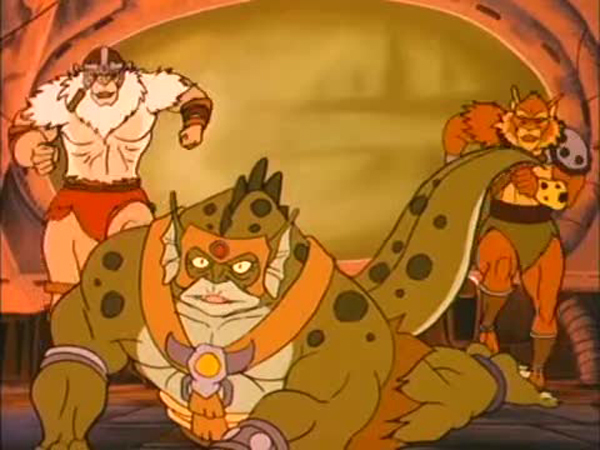 It is this sense of ruthless, self­motivated, naked ambition that makes Vultureman such an interesting character, and this episode would set the scene nicely for Vultureman’s teaming up with the Lunataks in ThunderCats’ second season. At the risk of stating the obvious, it would be fair to say that Vultureman carries this entire episode – for, the storyline surrounding it, whilst very entertaining because of the character it spotlights, is actually a very basic and straightforward story. What makes it work so excellently is the commanding on­screen presence of Vultureman as a character (aided in no small way by the outstanding, dramatic voice acting of Earl Hammond, who voices Vultureman). Towards the end of season 1, it seemed to become fashionable for all of the Mutants (except S­S­Slithe, who would appear to be relatively content with his lot in life as the Mutants’ leader) to attempt to strike out on their own, seize power, and/or strike an independent bargain with Mumm­Ra, with “Monkian’s Bargain” and “Jackalman’s Rebellion” both showcasing this story idea. What makes Vultureman’s tale so compelling is the fact that he has a ruthless, commanding evil about him that makes “The Super Power Potion” into a very believable twist for the character, and in this way the straightforward storyline is carried along brilliantly by the villain it spotlights. Although the animation for this episode is not amongst the series’ best, nonetheless both the visual direction of the shots and the excellent action sequences really raise this episode above others that have been animated in a similar fashion, allowing the audience to overlook the somewhat angular and flat­looking character models in favour of the other great visual aspects that the episode brings to the table. Which is not to say that this episode is a classic – in fact, there are a number of aspects of it that could be improved, not least of all adding some further element to the plot in order to make it more interesting. 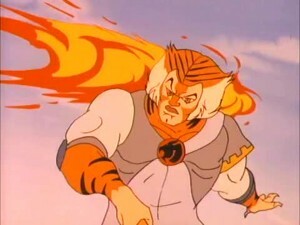 However, this notwithstanding, it’s a very enjoyable addition to the ThunderCats canon, and one that nicely establishes Vultureman as one of the characters to watch in future episodes. In this episode, we finally get to see Vultureman flying. Although in both the US and UK comics Vultureman would display the ability of flight naturally, in the cartoon series he apparently needs the effects of his Super Power Potion in order to be able to fly! When Vultureman attacks Tygra, the animation of Tygra turning invisible is reused from the episode “Mechanical Plague”. 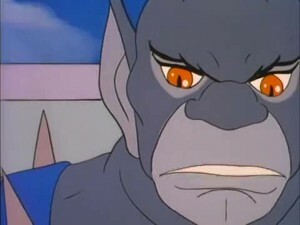 When the second half of ThunderCats’ season 1 was broadcast in the UK in 1990 – 1991, several of Panthro’s fight scenes were cut, presumably due to his use of the banned weapon, the nunchukus. These cuts followed similar such edits of the original Teenage Mutant Ninja Turtles cartoon series, which had debuted in the UK at the end of 1989. This episode is one such example of this editing, with Panthro’s fight scene having been completely cut when it was broadcast in the UK. An animation error in this episode shows Mumm­Ra swooping down to grab the Super Power Potion bottle from S­S­Slithe, which he successfully does – and yet, when Mumm­Ra flies out of shot, S­S­Slithe is still holding the bottle! 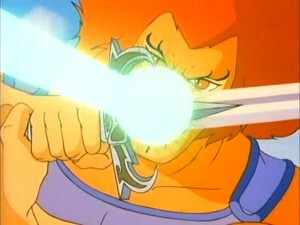 In his final fight scene with Lion­O, Vultureman attempts to defeat the ThunderCat with a powerful ring. 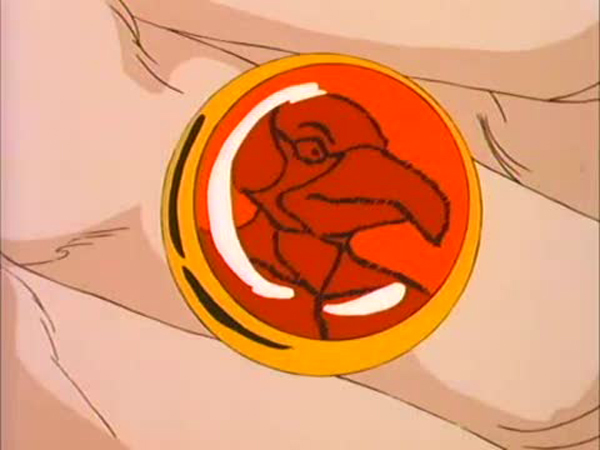 No explanation is given as to why Vultureman is using the ring, where it comes from or how it ties in with the powers he has acquired from ingesting his Super Power Potion. However, in many ways, the ring and the power it displays are something of a homage to DC Comics’ superhero Green Lantern! 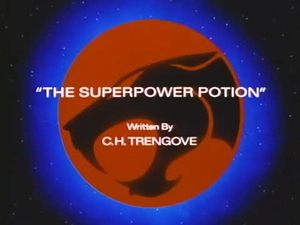 Although she is still credited in the closing credits, this is the first episode of ThunderCats where Lynne Lipton doesn’t voice a single character – indeed, this is the first episode of the show where not a single female character appears!